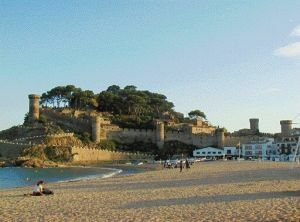 From Barcelona to the north we come to the Costa Brava, Blanes has a long and quiet beach in the town. The marina has moorings Blanes for the night, gas station and showers. Prevailing winds are from the East and West. Good places to anchor are the Punta Santa Ana, La Falconera and between La Cala San Francesc and cala Falconera. In the north you can anchor in Cala Fanals. Further north the next port is Cala Canyelles, although its depth Akun can not enter into this port. We can anchor on the north of the entrance. Visiting Tossa de Mar, with its ancient fortress of the XII century with its narrow medieval streets and its three towers are very attractive. Can find Giberola Cala Bona and Cala. Further north, we found Sant Feliu de Guixols, with sandy beaches, is situated in a bay with a great beach and a newly renovated marina that offers good mooring and port services. 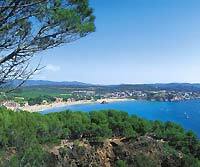 It is in Sant Feliu de Guixols, which gave name to the Costa Brava, ascending to the chapel which crowns the population will find the history of the name of the Coast, from that high place we have a vision of the entire south coast and to the north. Please note the harbor entrance in the leading line with the marks found on the promenade, and are not easy to locate during the day. The port is protected from all winds but should take special precautions when entering with winds from the east and south. Right next to Sant Feliu de Guixols, north S'Agaró is a large bay, protected homes and dotted with luxury hotels, with a good story like Charles Chaplin Celebrity, Humphrey Bogart, Eva Gardner and so on. who spent long periods there. To the north are Platja d'Aro, since there are some rocks and shoals is best to stay away from the coast. The port here is well equipped. find Palmas, a beautiful town and deserves your visit. In XIV century church, we climb to Punta del Moli from where we have a vision of the Costa Brava unforgettable. Palamos has two ports, one commercial and one sport to the north, both have good services. Sailing north of Palamos have beautiful coves to anchor such as: Cala Fosca, Cala de Calella and a group of small islands, the islands Formigues. The coast is rocky and steep coves and caves filled to visit with the dinghy. In any case, the decisions of course, anchoring and schedules or departure date will be contingent upon the weather, the last decision of the skipper.